While visiting the Knight Rider set we met a bunch of really cool stand-ins and stunt doubles for the major cast members. But when it comes to picking a favorite, I think we might have to agree with Picture Car Coordinator Charlie Ping. That's right our favorite is KITT's stunt double, a car that goes by the name KR3. Find out why by watching the video below. hello, what jacket model use Justin in the serie? please don't stop making the movie. we all love the series. Shelby GT500 KR with Automatic Transmission? Hahaha... i Love this car !!!! we need mutch moor of this car and michael the new show was great. I hope there´s gonna be another season. I think it would be stupid of NBC to cancel this show,its great fun! I want MORE! Please I am addicted to this mega show I do not miss any days you want. You can send me all the seasons? 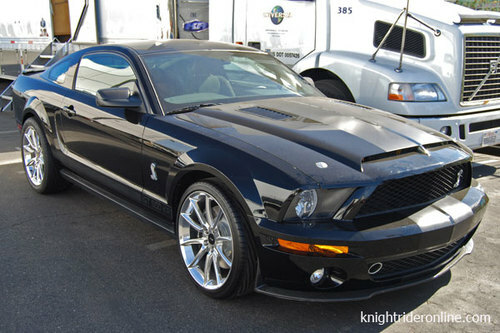 Since I'm talking about this encriver Mustang that is my dream all my life and it was this car? people who pretty much machine Congratulations to you all, this machine is doing a more successful here in Brazil, people I am the biggest fan you are of them more. I'm sorry, but I have to disagree with you. I think the new one is just as good if not better than the original one. There is no duplicating the original with the Hoff, but this new one is a breath of fresh air comparied to what is on TV these days. I hate the new series AND the new car!! If the new series had the old KITT that would be alot better!! the Kitt 3 is way better Go Ford!!!! i love a khight rider. can a normal car be a khight rider n how? I'm interested in buying the rims that are on KITT. Any ideas what they're called or where I can find them? hey............when knight rider season 2 start? I always watch knight rider on tv because i like the car. Wen will the film come on dvd.brng back the progrome.on itvq1.with the old sports car. signed kelvin syme. i miss this tv show. is there going to be another knight Rider or is this the end. I also like Kitt the car. I wish i had one who talks like him. Im your fan. I watched it every wed night at 8. I hope youll make another one soon. Hi, You Know That Comment That Said About K.I.T.T. That If You Want To!!!!!!!!!!! What kind of car and model was kitt ? if the show is being cancelled, i'll take kitt, thanx!! Pretty cool! They need to do the programming option per the owners manual to turn off the seatbelt reminder chime though. Are the rumors true about the show being cancelled after the first season. i beleave the show has done well. Justin not bad man not bad. All you need is the David Fro and a ton of chest hair lol. And don't forget the gold chain. Also if there is a season 2 and i hope there is will Mr. Hoff be in any of the shows maybe as a mentor to his son/. Miles Per Hour. Don`t Forget The Scanner Too. Season 1 : Exellent buuuaaannggeetttt..!!! Uh Oh looks like someone wasn't wearing there seat belt :). Thanks for taping this Sue for us gear heads :). Pitty the show is canceled.